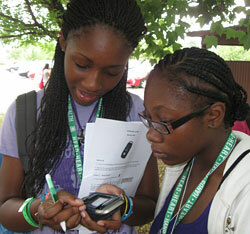 4-H Science is informal science education within the context of positive youth development. It is not just science education. This is an important distinction to make when approaching potential program partners and funders. 4-H Science is committed to delivering "Science Ready" 4-H experiences. A science ready program is framed in science concepts, based on science standards, and intentionally targets the development of science abilities and outcomes articulated by the 4-H Science Logic Model (see 4-H Science 101 in Resources below). Additionally, science ready programs integrate the Essential Elements of 4-H Youth Development (Essential Elements) and engage participants in age appropriate, experiential, inquiry-based learning. It is important to understand from the beginning that a "program" is much more than a one-time activity. Ideally, programs should be of sufficient frequency (how often the program meets) and duration (how long the program runs – days, weeks, months, etc.) to allow youth to experience and increase mastery, independence, sense of belonging, and a spirit of generosity (Essential Elements). Programs are delivered within the appropriate positive youth development (PYD) framework (safe environment, caring adult, etc.). The 4-H Science Checklist (see below) includes seven questions designed to help assess whether science programs are "Science Ready." Science ready programs provide youth with a sustained learning experience, with opportunities to engage in the program for the appropriate frequency and duration needed to master specific 4-H Science Abilities (see 4-H Science Checklist below). Program activities are also sequenced to help youth build upon previously learned skills. Science ready programs are not one-time activities or events. The goal for 4-H Science programming in all venues is to move beyond offering activities to providing youth with ongoing, sequential programming that leads to mastery. Building science ready programs takes time – rarely does a newly created program launch with all systems firing perfectly! The important thing is to get started. Begin with current programs and carefully target areas for improvement. The purpose of 4-H Science Program Design – 4-H Science Checklist is threefold: (a) to introduce the 4-H Science Checklist; (b) to provide promising practices to support each of the seven criteria of the 4-H Science Checklist; and (c) to promote 4-H Science 101, a scripted, four-hour training that can also serve as a crucial resource for developing "science ready" programs (see 4-H Science 101 in Resources below). The 4-H Science Checklist (below) will help program planners self-assess the science readiness of current programs, as well as provide guidance for developing new science ready programs. 4-H Science 101 includes a simple-to-use table that can aid with self-assessment of program activities (see Appendix I – Make a Better Pinwheel: Review and Share). Are you providing science, engineering and technology programs based on National Science Education Standards? Science education standards are criteria to judge quality: the quality of what young people know and are able to do; the quality of the science programs that provide the opportunity for children and youth to learn science; the quality of science teaching; the quality of the system that supports science leaders and programs; and the quality of assessment practices and policies. Are you providing children and youth opportunities to improve their Science Abilities? Are you providing opportunities for youth to experience and improve in the Essential Elements of Positive Youth Development? Do youth get a chance at mastery – addressing and overcoming life challenges in your programs? Do youth cultivate independence and have an opportunity to see oneself as an active participant in the future? Do youth develop a sense of belonging within a positive group? Do youth learn to share a spirit of generosity toward others? Are learning experiences led by trained, caring adult staff and volunteers acting as mentors, coaches, facilitators and co-learners who operate from a perspective that youth are partners and resources in their own development? Are activities led with an experiential approach to learning? Are activities using inquiry to foster the natural creativity and curiosity of youth? Does your program target one or more of the outcomes on the 4-H Science Logic Model and have you considered the frequency and duration necessary for youth to accomplish those outcomes? The promising practices that support "4-H Science Readiness" are divided according to the seven items on the 4-H Science Checklist (above). Include teens in program planning, implementation, and evaluation. Teens may be one of the most underutilized resources available to 4-H professionals engaged in developing 4-H Science programs. Teens can assist in creating and implementing needs assessments, identifying engaging curriculum, facilitating programs, data collection and evaluation, and so forth. In addition, utilizing teens as cross-age teachers/mentors opens up lots of opportunities for positive youth development (see also Staffing with Teenagers and Teens as Cross-Age Teachers). The 4-H Science Logic Model will aid with program development and provides outcomes for program evaluation. The 4-H Science Needs Pre and Post Assessments will help assess staff and organizational capacity to deliver 4-H Science programs. The 4-H Science Core Competencies and the 4-H Science Competencies Self-Assessment Tool will help focus program development in the context of positive youth development, as well as guide professional development trainings (see Item #3 in Trained, Caring Staff and Volunteers as Co-Learners below and Training Others to Deliver High Quality Science Programming). The Program Evaluation Development Worksheet will help outline the evaluation component of the program. Develop measurable process and outcome objectives. Work with program partners to create meaningful objectives. Keep in mind reporting needs (including partners) and ensure there are objectives to address those needs. Process objectives focus on program design and implementation. Outcome objectives include changes in youth abilities, skills, knowledge, attitudes, behaviors, etc. Do not forget to specify relevant 4-H Science Abilities from the 4-H Science Checklist. Identify success criteria/indicators for process and outcome objectives. Include assessment criteria for staff/facilitators, as well as the partnership (if applicable). Contact campus-based faculty/specialists in program evaluation for assistance. Outline data collection and analysis responsibilities and timeline with program staff/volunteers (include in MOU if a partnership – see Section Introduction to the Partnerships, Resource Development, Program Growth and Sustainability section). IMPORTANT: Program evaluation/assessment criteria and data collection methods may need to be creative, and should certainly capture the spirit of 4-H Science programs (e.g., focus on science/inquiry processes, the Essential Elements of Positive Youth Development, foundational skills, etc.). Perhaps the worst thing that can happen regarding evaluation/assessment is if the facilitator feels he/she must "teach to the test" so youth can "successfully" complete knowledge-based assessments. This poses a very real danger of stifling the inquiry process! Share evaluation results. Program successes should be disseminated to partners, stakeholders, advisory boards, funders, the community, etc. Present results at meetings and professional conferences. Prepare reports, press releases, and journal articles as appropriate. Select inquiry- and research-based science curriculum that supports program goals. This practice cannot be over-emphasized. For more in-depth information see Item #1 in the Program Planning and Evaluation section of Inquiry Based Learning Approaches. Correlate science programming with state and national educational standards. Demonstrate to formal education partners how informal science education can support (increase foundational skills) classroom learning. Develop programs using modified club formats. Remember that 4-H Science is science in the context of positive youth development (PYD). As much as possible, incorporate traditional 4-H club components that support PYD such as public presentations, leadership, community service, etc. Recognize that youth can be scientists today. Plan activities that allow youth to "be" scientists today, and to see themselves as scientists tomorrow. Youth should use "real" tools and instruments and engage in "real" projects (e.g., water quality monitoring, GPS/GIS community mapping, etc.). Create a program name that includes the word "scientist." Use appropriate titles for the roles that group members will undertake (e.g., engineer, project manager, recorder, reporter, technician, materials coordinator, etc.). Ensure each group member has the opportunity to experience each activity and role. Read the chapter Providing Youth Authentic Opportunities to Practice and Share Science Abilities.This chapter provides an in-depth discussion of promising practices. Incorporate opportunities for youth to practice 4-H Science Abilities. Clearly identify the Science Abilities included in the program and/or curriculum (if unable to identify, look for another program/curriculum). The identified abilities should be specified in the program goals, and assessed as part of program evaluation. Do youth have a chance to make decisions? What new skills does the program or activity foster? Programmatically, how can the program or activity reach beyond the realm of science to become a positive youth development experience – and a fun one? Caring Adult: Understands that each young person benefits from a positive relationship with a caring adult by . . . (see 4-H Science Core Competencies). Safe Environment: Creates an emotionally and physically safe learning environment by . . . (see 4-H Science Core Competencies). Inclusive Environment (belonging): Designs inclusive learning environments by . . . (see 4-H Science Core Competencies). See Oneself in the Future (sense of hope): Nurtures an atmosphere of optimism and a positive belief in the future by . . . (see 4-H Science Core Competencies). Values and Practices Service to Others: Encourages an ethic of caring and civic responsibility by . . . (see 4-H Science Core Competencies). Opportunities for Self-Determination: Encourages and supports independence in youth by . . . (see 4-H Science Core Competencies). Opportunities for Mastery: Provides opportunities for youth to develop skills, competence, and expertise by . . . (see 4-H Science Core Competencies). Engagement in Learning: Encourages youth to direct and manage their own learning by . . . (see 4-H Science Core Competencies). Pair service-learning with science. Provide opportunities for youth to engage in authentic, community-based projects that also support learning objectives and the Essential Elements. This is where youth have a chance to voice opinions, make decisions, plan and carry out ideas, and feel like they have made a difference (see also Providing Youth Authentic Opportunities to Practice and Share 4-H Science Abilities). Read the chapter Training Others to Deliver High Quality Science Programming. This chapter provides an in-depth discussion of promising practices for training staff and volunteers to deliver 4-H Science programs. Utilize the 4-H Science Competency Self-Assessment with staff and volunteers. Program staff/volunteers need to understand and have the capacity to effectively implement the core competencies in the context of program activities. This tool will help improve 4-H Science program delivery and aid in staff development, but is not intended for use in performance reviews (see 4-H Science 101 in Resources below). This assessment will reveal strengths and challenges in implementing the core competencies. Review results individually with staff/volunteers and help them set personal goals. Develop training modules based upon overall results to address opportunities for improvement. Remind staff and volunteers often that they should be "co-learners" with youth. Staff/volunteers should understand they are not there to provide answers (indeed, it's okay to not have the right answer). They must be willing to explore and learn together with youth. This principle can be especially difficult for staff/volunteers coming from the formal education system. One way to circumvent the tendency to provide answers is to engage in "real" community-based projects that do not yet have a solution! Engage youth as partners in their own development. This practice goes hand-in-hand with experiential and inquiry based learning. Read the chapter Providing Youth Authentic Opportunities to Practice and Share Science Abilities. This chapter provides an in-depth discussion of promising practices for practicing and sharing 4-H Science Abilities. Read the chapter Inquiry Based Learning Approaches. This chapter provides an in-depth discussion of promising practices to support inquiry based learning. 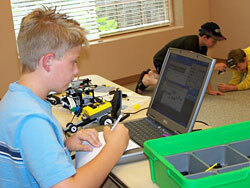 Utilize the planning and evaluation tools in 4-H Science 101. See Item #2 in National Science Education Standards section above. Plan adequate time and experiences for youth to achieve mastery of 4-H Science Abilities. There is no magic number as to the number of hours it will take youth to master any given set of skills or abilities. Much depends upon the previous background and experience of youth, in addition to the degree of difficulty of the skills. Review what has worked for others. It may take several program cycles to arrive at the ideal program frequency and duration. Enfield – Youth/Adult Science Clubs Supporting Science and PYD Outcomes. Youth/Adult Science Clubs is a program piloted, developed, and evaluated through the University of California 4-H Youth Development Program in San Luis Obispo (SLO) County. This program is most often referred to as simply SLO SCIENTISTS. SLO SCIENTISTS has demonstrated efficacy and sustainability for the past 15 years and has been featured as a model program at science and youth development conferences, as well as in the literature on youth development. 4-H SLO SCIENTISTS focuses on developing science clubs where a youth aged 8-12 enrolls with an adult (a parent, significant adult or mentor). Each youth-adult pair or dyad participates in learning and practicing the skills of scientific investigation through volunteer-facilitated, hands-on inquiry based STEM activities. Dyadic learning is complemented with group learning to create a dynamic where knowledge is co-created and learning is mutual. Club cycles are 8-10 weeks long, each with a specific curricular focus, and dyads can and often do choose to continue for multiple cycles (with different curriculum). Clubs are facilitated by a trained volunteer recruited for his/her interest in teaching science to youth. 4-H Science 101 – this training guide provides four hours of activities that will help introduce your staff and participants to the development, delivery, and assessment of 4-H Science programs. Available at: http://www.4-h.org/resource-library/professional-development-learning/science-training-guides-resources/. 4-H Science Professional Development Toolkit – an online set of resources and training activities to be used by youth development professionals and volunteers to prepare them to support 4-H Science programs. Includes the 4-H Science Checklist, 4-H Science Competencies, and Experiential and Inquiry-Based Learning Methods in 4-H Science. 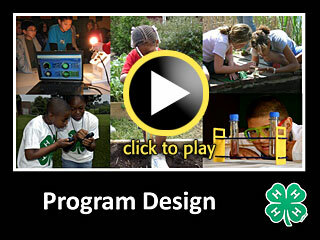 Available at http://www.4-h.org/resource-library/professional-development-learning/science-training-guides-resources/.